Born in Fife he trained at the art school in Paisley and in South Kensington winning Gold Medals at the RA in 1876 and 1877. 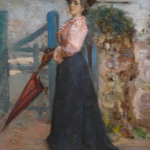 He moved to Pais 1882-1885 and on his return became a founding member of the New English Art Club. In 1893 he returned to Glasgow, Christie was known for his genre and allegorical painting executed in a broad style and for his pictures of children and scenes from Burns. Christie was associated with the Glasgow boys.